Over the past few weeks, our group has been taking steps to plan the details of our focus group discussion that will take place in Williams Lake. While waiting for the online survey and open-ended questionnaire responses from the students, we have been discussing ways of grouping the students with Mike Franklin, the school principal. Currently, the students are broadly placed into classes based on their Social and Emotional Growth level, rather than age. These four levels reflect on areas including students’ attendance, class participation and ability to problem solve. By using a similar method for our focus group discussions, we hope to provide a familiar and comfortable setting for students as these will be peers they interact and see on a daily basis. Additionally, this would enable students to discuss issues which may be affecting their particular level, and be an ideal time for them to brainstorm solutions on some of these issues. However, it is also important to note that students are not necessarily aware of their particular Social and Emotional standing. There may be a possibility that this will be discussed with the students, but this decision will be determined by the Skyline staff members and principle. Furthermore, once we have receive the survey data back later on this week, we will begin analyzing the results and shaping more concrete ideas for our focus groups and video. This will be our very first means of contact with the students and we are extremely thrilled to learn about their overall experience and satisfaction as students of Skyline. We hope to analyze the survey data in conjunction with each students’ social-emotional growth level using the students’ Personal Education Number. This will enable us to highlight any existing patterns of correlation we observe. Do students in ranking in level 1 for social-emotional growth display similar attitudes in their responses? What about students in other ranks (2-4)? What about students with similar housing situations? We will need to analyze through an intersectional framework to understand the complex factors that influence their responses. What do you like best about Skyline? What is the best thing about being a Skyline student? If you could describe Skyline in three (positive) words, what would they be? By undertaking this collaborative video project, we hope that we can bridge the gap between researchers and research participants. We also hope to give the students a sense of agency which will empower them to feel like they are playing a pivotal role in reducing the negative regarding alternative school students. We hope to include the students in the planning process by giving them the creative freedom to direct, film, act, and edit the final video. Ultimately our goal is to produce a tool that is meaningful and created by the students, for the students and the broader community more generally to create a positive light associated with alternative schooling. This entry was posted in group reflection on April 4, 2016 by Angela Ho. Over the past couple of weeks, our group has been working with Mike to develop two preliminary surveys that we would administer prior to our arrival to Williams Lake. Mike and Siobhán have been supportive of us through this process, as they have offered valuable suggestions and insights to help us refine our survey questions. A full discussion of our chosen research methods can be found here. Mike has agreed to administer the surveys after the students return from Spring Break, and will have the results sent back to us around April 5th. This will be extremely helpful, as we will have the opportunity to learn more about the different students at Skyline and begin compiling the student feedback as data for the analysis of the surveys. Between now and then, our group will continue to do more research and further educate ourselves about the Williams Lake community and various studies regarding alternative education systems. One important thing that Mike mentioned in our previous meeting was to be prepared to face changes in the direction of our research question and focus upon our arrival to Williams Lake. Specifically he talked about how our relationship and engagement with students on a personal level will contribute and potentially inspire other avenues of where we choose to explore. This will be a vital point to keep in mind, both as researchers and outsiders of the Williams Lake community. We should be adaptable to the unexpected changes that occur along the way throughout the entire research process. This entry was posted in group reflection on March 10, 2016 by Angela Ho. In week 5, we met with Leo to talk about our ideas for the final project. Like other groups, Leo suggested that we narrow down our research question to something more specific. To refine our research question, we examined existing literature and case studies to gain a better understanding of the structure, goals and challenges of alternative education. A summary of our findings and key takeaways can be found on our Initial Theoretical Framework page, under the Research tab. First, we will create an online survey that will be filled out prior to our arrival at Williams Lake. This survey will allow us to gain insight on the student demographics, and will serve as a springboard for what we will do during our time in Williams Lake. Second, we plan to conduct focus groups to gain insight on the learning needs of the Skyline Students. Third, we hope to create a video to promote more positive perceptions of Skyline Alternate School to the Williams Lake community. As it may be difficult to manage and do justice to all three projects, Leo suggested that we find a way to combine the survey and video together. A potential idea is to replace the video with another form of data visualization, such as a word cloud, to display the results from our survey. Because our community partner is keen on conducting surveys with the students over the long term, it would be interesting to see if the word cloud could automatically update itself to publish live results. Once we refine our research question and focus of the initial surveys, we will gain a better sense of what our focus groups may look like. 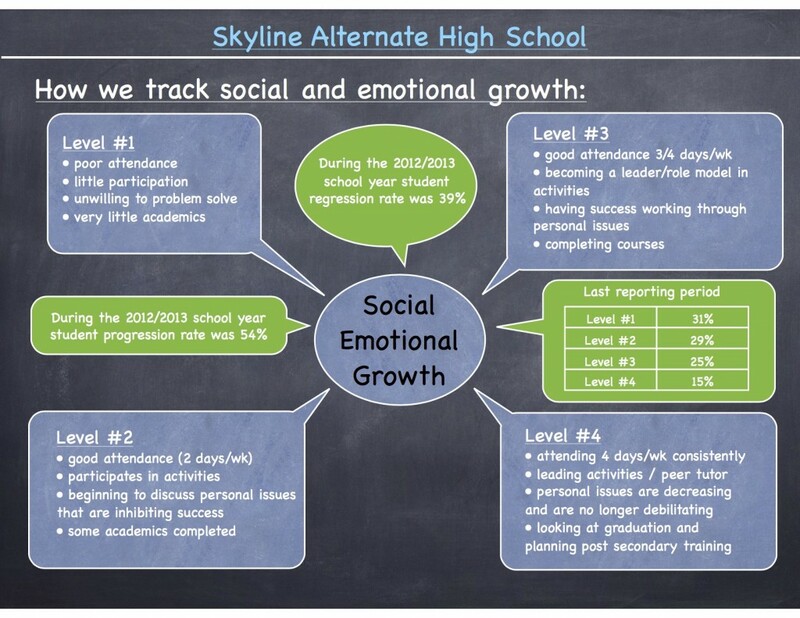 What are the underlying pull factors that are attracting students to Skyline? What are the push factors in mainstream high schools that are causing students to leave their former schools? Was it their choice to come to Skyline? Or was it out of the student’s’ control? He recommended that we could construct our survey into two parts, the first as a questionnaire that could be completed online with short multiple choice, yes/no responses, and the second a written portion through a more comprehensive part that enables students to express their personal experiences. We are still in the process of creating the questions and platform for conducting the services, which we hope to have done within the span of the next two weeks. According to their last reporting period (2012 – 2013), the composition of students were as following: Level 1 = 31%, Level 2 = 29%, Level 3 = 25%, Level 4 = 15%. This is certainly something we will take into consideration in our in the structural formation process of creating focus groups. Over the reading break, we plan to refine our research question. Please check back for more updates! This entry was posted in group reflection on February 11, 2016 by Cheng Yee Seah. Over the last week and a half, we have been able to meet with our community partners Mark Thiessen, superintendent of School District 27, and Mike Franklin, principal of Skyline Alternate. Our initial meeting with Mark gave us a better sense of our research focus. Together, we decided that we would build off of last year’s project by examining the operational changes that are beneficial for addressing the various needs of students at Skyline Alternate School. Mark expressed an interest in developing a data collection tool that would enable the school board to survey the needs of its students over the long term. This could assist the school board in addressing the learning needs of a changing student demographic, as there is a rising influx of students over the past 5 years. During our meeting with Mike, we discussed our current knowledge of Skyline Alternate School. In the past Skyline has been a school that primarily takes in students that have history of getting in trouble with the law, suspension or expulsion from their previous school(s). However, over the more recent years, there has been an increase in the demographic of students, with more students choosing to attend Skyline out of their own will, due to various factors, such as the accommodating self-paced school schedule and smaller class sizes. However, as Mike mentioned, there is still a strong negative stigma surrounding Skyline as a school for troubled students who have been kicked out of mainstream schooling. One of the main goals Mike would like to address is: how can we change the negative public perception and stigma associated with Skyline into a more positive and accurate depiction of the current demographic of students? One of the ways we suggested is to create a tool using multimedia programming, such as creating an informative video available for public access that addresses the current circumstances of Skyline, in a more positive light. Another concern that we spoke to Mike about was the application and acceptance process for incoming students that are keen on attending Skyline. Some of the major problems include: with the overwhelming number of students choosing to attend Skyline, in conjunction with the number of students whose only choice is Skyline because they have been forced to leave their former schools due to their troubled background, how can there be a fair decision in choosing which students to prioritize in the intake process? These are some of the issues that we will need to consider in our work with Skyline, their teachers, students, and programs. We plan to speak to Leo within the next week to further discuss our research question, so stay tuned for more updates! This entry was posted in group reflection on January 28, 2016 by Angela Ho. After our initial bonding activity during the False Creek walking tour, our group sent out our first email to School Distrct 27. While there were some minor delays in communication, we were able to schedule our first meeting with the School District for this Thursday, January 21st. As we waited to hear back from our community partner, we conducted our secondary research about School District 27 and the Williams Lake community. By doing further research, we hoped to brainstorm potential research topics and questions for our project. In order to garner a better understanding about our community partner, we spent time reading through their website, where we learned more about the people they serve, their mandate, and the strong push towards creating unification between the School Board and the various First Nations bands throughout the Chilcotin and Cariboo districts. In addition, we explored the blog and read the white paper created by last year’s SD27 research group. This gave us a better understanding of the educational environment of Williams Lake, and allowed us to get an idea of potential research directions that we could pursue. As we prepare for our first meeting with the School District, we have brainstormed some questions to ask our community partner. Below are some questions that we hope to discuss with Mark Thiessen, the superintendent of School District 27. SD27 hosts an annual First Nations Role Model contest, which appoints two students of Aboriginal identity as winners each year, for being the top well-rounded students, that exemplify excellent academic and service within the community of Williams Lake. How does this program impact the community of First Nations students? For example: does it encourage them to strive for higher goals and achievements? What are the key contributing factors to success for First Nations students in school? How does their cultural identity play a role in this? The outdoor education program hosted by SD27 has demonstrated the benefits of experiential learning for the students as well as the community of Williams Lake. In what ways can outdoor education be a feasible method of promoting nature conservation and environmental sustainability? How does such a program change these students’ perspectives on sustainable development? How does such a program benefit students in comparison to education in much larger cities? We are really excited to meet our community partner on Thursday. We hope to solidify our research question and proposal by next week, so check back for more updates! This entry was posted in group reflection and tagged group reflection on January 19, 2016 by Angela Ho. For our walk we began our journey at Olympic Village station. From there we headed over towards the park along the edges of false creek. Along the way we noticed a huge plot of land that seemed to be occupied as a parking lot, with a huge old and run-down building that was extremely rusty and vacant. 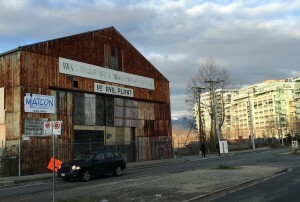 The faded sign appeared to read “Vancouver Mill Machinery…”. From our knowledge this was probably a log milling plant that was used during the years when Vancouver had a thriving industrial phase. As we continued on, we came across a sign about South False Creek’s new habitat island, shoreline and inlet. To recognize the historical significance of the area to First Nations groups in the area, native trees, shrubs, flowers and grasses have been planted along the waterfront path and on the habitat island. These features were created to provide an ideal home for various flora and fauna, and acknowledges the importance of the area to non-human beings as well. Moving forward we began to head in the direction of Main Street station. As we walked along the streets, we noticed a lot of newer housing developments that were being introduced to the neighborhood, many of which seemed to hold on to the name of “The Creek” as if to reminisce about the history of First Nations land and streams dedicated to fish and wildlife that live in and around these neighborhoods. In addition we walked passed several sewage drains that had pictures of fishes on them, to indicate the presence of fish and other sea creatures that live along the streams and shorelines. As we walked towards China Creek, we noticed a shift in land use from primarily high multi-story apartments, offices and community spaces, to more specialized services like ski and snowboard shops, fine art services, and even a local brewery. In addition most of the housing appeared to be older, low-rise apartments and small single-story homes, some of which were vacant and had signs to indicate future redevelopment. 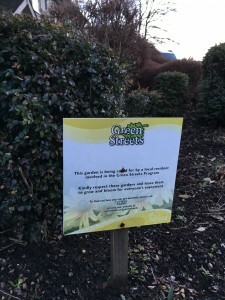 Along the sidewalks of these neighborhoods, we noticed that there was a prominent environmental initiative set in place called “Green Streets”. This community garden program allows local residents to have their own green space and grow their own plants, flowers and even vegetables and fruits for more sustainable way of living. Another observation we noticed was the presence of a montessori preschool and a community centre that catered to many kids and youth. This could indicate that the surrounding neighborhood is relatively safe from crime and heavy flows of traffic. When we finally arrived at the destination, China Creek, our initial reaction was that the park seemed quite underwhelming. Besides the playground and baseball field, there was just a huge plot of grass with a couple of people sitting on benches or walking around. 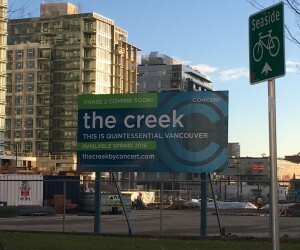 In the past, the China Creek system was one of the largest drainage basins in Vancouver. It served as the home to various sea creatures, such as salmon, sturgeon, crab, mussels and clams. 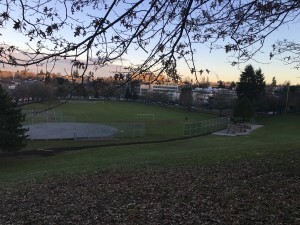 From the 1920’s to 30’s, the China Creek ravine was also used by the City as a garbage dump, until local residents complained about the smell and potential health risks. As a “green solution”, we suggest keeping better maintenance of the “Green Streets” initiative. Throughout our walk we noticed that many of these “Green streets” were poorly kept and appeared as visual pollution. These green streets exhibit the potential to promote a stronger sense of community and neighbourhood responsibility, and also help preserve some of the histories of plants and species that may have existed many years ago. This can be achieved by providing informative plaque cards of important species and its historical links to the First Nations people and their land. Our inspiration for this idea came from similar information boards that we found at the start of our walking tour near Habitat Island. In addition, we suggest an increase in resources available to residents wishing to maintain these garden spaces. Although this initiative is volunteer driven, the creation of better signs could help indicate public accessibility, and also outline the action volunteers can take to maintain this initiative. We believe this could be a cost-efficient and feasible solution that extends the current environmental preservation work currently near Habitat Island. Our group thoroughly enjoyed this walking tour activity. It enabled us to realize the smaller details in our surroundings that we often miss when we are commuting and in a rush to get to places. It is so easy to take our land and space for granted, without realizing its historical significance and the impact we have on its fauna species and biodiversity. Through this activity, we were able to learn more about each other but also understand the importance of local community partners, in areas such as Williams Lake. This entry was posted in group reflection on January 11, 2016 by Cheng Yee Seah.